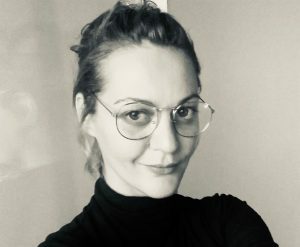 Jelena Rosic is a PhD student with her background in professional film editing (dramatic arts), cognitive film studies with embodied perspective and neuroaesthetics of film. Her interdisciplinary research combines empirical phenomenology and enactive cognitive sciences to study embodiment in the spirit of neurophenomenology (Varela 1996). She has specialized in the second-person methods, in particular, the micro-phenomenological interviewing and analyses method (trained with Prof. Claire Petitmengin,) to explore usually unrecognized or inaccessible dimensions of lived experiences (see microphenomenology.com). Her micro-phenomenological research in the context of augmented sense-making has focused on identifying the conceptual and empirical groundings of meta-perceptual modalities that are reported to emerge in lived experiences of technologically enhanced embodiment. As a member of the NeuroCine research group led by professor Tikka at Aalto University she gained several years of experience in conducting interdisciplinary research within neurocinematics, a line of research that applies cognitive neuroimaging methods to study intersubjectively shared narrative experiences of film viewers. In the NeuroCine she participated in developing systematic annotation methods of film stimuli for optimising the linking of cinematic features to fMRI data. As a PhD candidate at the Crucible studio, a research group at Aalto University that investigated interactive media combining theoretical and empirical methods, she applied her neurophenomenological approach to the study of enactive narratives. Jelena’s current research at Enactive Virtuality Lab applies the micro-phenomenological method to provide understanding on the lived experience of narrative sense-making in the context of movie viewing and engaging immersive environments.